A view from the cycle path: The "Copenhagen Left" and merging of cyclists with cars turning right: Dangerous and inconvenient junction design in Denmark. I believe the left turning manouvre described is known as a "hook turn", and is the standard manouvre on motorbikes in Taiwan. I can see its use where a left turn would normally be prohibited (or a right turn in the UK) . Having said that, having the cycle lane turn into a right turn lane means that not only do you either have to sit behind or filter past turning vehicles, (ideally on the outside, because they're turning) but that turning vehicles can cut you up, which seems to be a major hazard in London and elsewhere. When you are performing a left turn as described in the first illustration and you are waiting in the left turn waiting area you can legally cross the road for red if there are no vehicles coming from or towards the direction you just came from. The problem with this is that in heavily used junctions there will always be traffic so you end up waiting for green anyway. If it is smaller junctions almost all cyclists will turn left the same way as a car would do it. Its interesting to see that places in NYC are adopting this "mixing zone" that it seems some Danish planners think "first class" I have seen this idea talked about multiple times and it does not make me comfortable. Yes designating this area is better than what we have in most of the country, but I think places are striving for the wrong thing by holding the second best cycling infrastructure as the best it could be. I find it surprising that many countries feel the need to 're-invent the wheel' when it comes to infrastructure for cyclists - I'm not aiming this at Denmark particularly but it appears they're doing something here that has been tried and rejected elsewhere as 'sub-optimal'. The result of this is sub-standard separated infrastructure and sub-standard integrated infrastructure. Freewheeler has an excellent post on this here. Bad on-road conditions encourages no new cyclists and the poor segregated infrastructure gives ammunition to the 'vehicular cyclists' in their argument against against separation. They do the same here in Australia, pointing out, helpfully, that, "we do things differently here; this is not Europe", and other unhelpful jibes; while producing rubbish bike lanes on the roads with a bit of paint (green is the preferred colour here). Why don't we all save some time & money and look to where it is being done well (ie. NL), backed by solid data and go from there... is it really that hard!? you know, when people are not following good examples, there is an underlying unstated reason. the only one i can think of to prevent other countries following the netherlands is that it is copyright. is it? don't laugh. a lot of these things are tendered to private designers, and they will copyright their efforts. Similar here in Vienna. Indirect left turns for cyclists and pedestrians. Most of the time there is not even enough space to wait, and one ends up blocking cyclists that want to go straight on.. 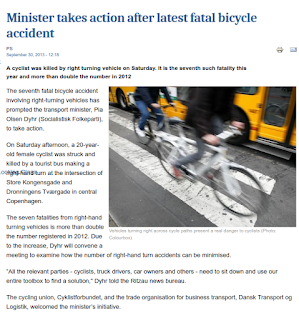 However, I suppose it's not so bad in Denmark, as there are generally more cyclists on the road than in Austria. The view to the cycle path is not obstructed either. So probably not that great, but not really unsafe (as compared to countries where people driving cars don't expect cyclists to appear beside them when they want to turn right). Anthony: In this case I don't think it has anything to do with copyright. And frankly, if, say, British councils were somehow forced to employ Dutch contractors they would save a fortune given the quality built at a price here. Anna: Mikael says that Vehicles turning right and hitting bikes is the most common form of accident for cyclists in Copenhagen. I think it's odd that they're not taking more comprehensive steps against these problems. 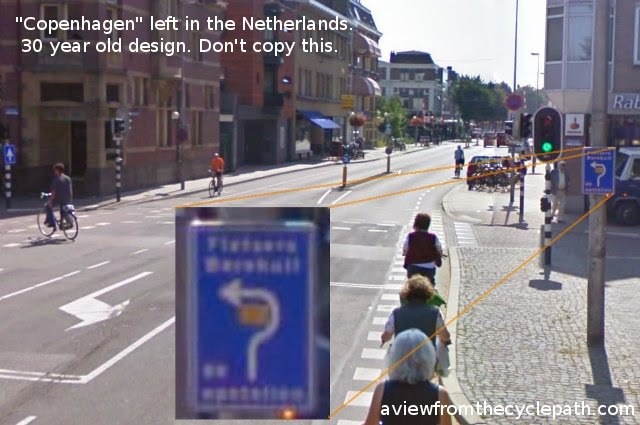 I've seen that kind of arrangement in the Netherlands exactly once: at the Nagtegaalstraat/Maliebaan junction in Utrecht, complete with non-standard sign outlining the route, see Google Street View. It's a bit awkward, but the left turn in question is a low-traffic manoeuvre and Maliebaan is such a landmark street that it'd probably do more harm than good to fix it. It's interesting about the lights sometimes being green in all directions for cyclists and red for cars. You can't imagine such a thing for bikes here but similar setups are cropping up all over the UK for pedestrian crossings (Glasgow has a lot of these) where they can cross a junction diagonally in one go rather than having to wait for two cycles of lights (whereas in other parts of the UK pedestrians have to wait for two cycles just to cross one road. Grr). In fact, a lot of the best infrastructure we have here is for pedestrians - can you imagine something as labour intensive as a lollypop lady being offered to child cyclists? yet it would solve a lot of the recent angst about children cycling on their own to school. The best infrastructure we have in Southwest Scotland - completely separated from cars, direct and well signposted, well lit, well surfaced and kept swept - is shared use and, as you might expect, mainly used by pedestrians. Anonymous: Thanks for your post. Nice to see an exception. As you say, the Maliebaan is somewhat special. It's the site of the first cycle path in the Netherlands dating back to 1885. Not all high traffic intersections require you to cross twice to make a left turn. I do agree with your view. But, you should understand that for some of us, even the not-so-well-thought Danish cycling infrastructure, or even the German one is light-year in advance compare to our local one! You should pass by Toulouse, France and see how unfortunate we are down here! Although in 9 years things have vastly improved. Since more than ten years I visit Copenhagen several times a year and I am very familiar with the infrastructure for cyclists in the Danish capital. I don´t see a big disadvantage to turn left indirectly like in Copenhagen. In general the rules for cyclists are very easy in Copenhagen. If there are cycle tracks ore cycle lanes they are always on both sides and cyclists have to use them on the right side on the street. If there are no cycle tracks or lanes cyclists run on the road lanes. Cyclist don´t use the sidewalks, they never run on the wrong side of the street. At intersections cyclist turn to the left indirectly. They never have to stop and and use a push-button to get a green signal. In Amsterdam I have noticed many cyclists on the wrong side of the street even on very narrow cycle tracks hindering other cyclists using the cycle tracks on the right side. At several intersections there are push-buttons. And still many cycle tracks are built with red clinker stones on an undercoat of smooth sand, for example in the new quarter of Ijburg. Even now after only a few years the stones are no more even, the surface isn´t nice to cycle. Copenhagen cycle tracks are always designed with smooth asphalt. Many cycle tracks are built on one side of the street for cycle traffic in both directions. As far as I know this from bad infrastructure in Germany this leads to cycling on the wrong side even on those cycle tracks where it is not allowed, as mentioned above. 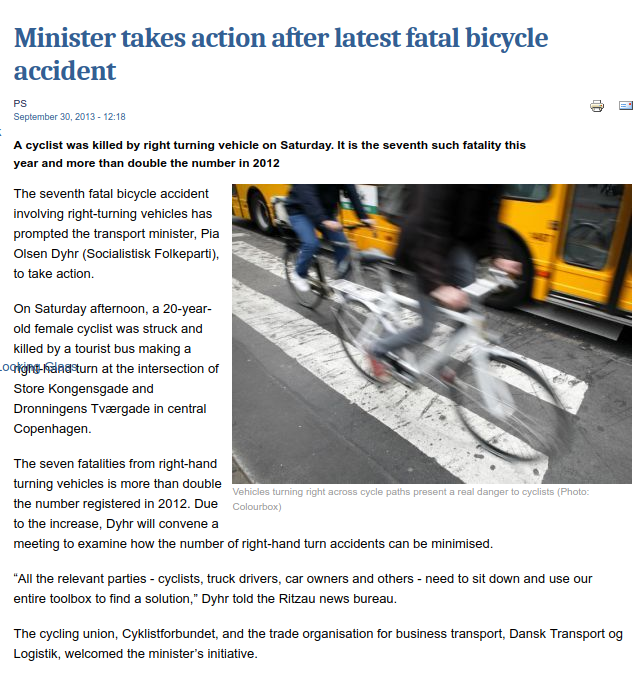 But cycling on the wrong side (left side) causes more accidents with car traffic than cycling on the right side. And even in Amsterdam I know cycle tracks along main roads where cyclists can not pass one another. Old-fashioned cycle tracks still exist and do not allow to pass slow cyclists. Typical for the Netherlands are missing storage surfaces at intersections. If you pass a sidestreet the cyclists coming from the sidestreet stay in your way waiting at the red signal. This never happens in Copenhagen. townmouse: I think there is something in the idea of cyclists getting together with pedestrian groups in the UK. However, you have to be careful. More low quality "shared use" is not what the UK needs. Jean-Christophe: I do know what you mean, after all I came from Britain, where almost anything is possible. How does Toulouse compare with Paris ? That's because in the UK red lights do not apply to pedestrians. Traffic lights are to control traffic and do not apply to pedestrians. Pedestrian lights are only advise for pedestrians, to let them know when the traffic has been stopped. 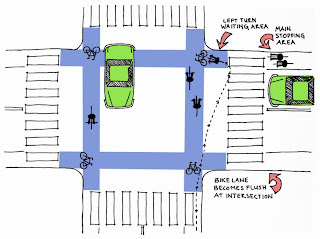 There can be left turning problems if there are so many bicyclists that those turning left blocks those going straight. A good example of this is http://maps.google.com/maps?f=q&source=s_q&hl=en&geocode=&q=Dronning+Louises+Bro,+K%C3%B8benhavn,+Danmark&sll=37.0625,-95.677068&sspn=55.192325,67.5&ie=UTF8&hq=&hnear=Dronning+Louises+Bro,+1360,+K%C3%B8benhavn,+Denmark&ll=55.686255,12.565532&spn=0.000607,0.00103&t=h&z=20 where lots of bicyclists arrive from the lower corners, and lots of them go out of the top left corner. Another problem is that cyclists going straight do not stay behind the white line, but continue into the waiting area for cyclists turning left. But as i can see in the 2. video you link to, dutch cyclists do also block each others path. And so do motor drivers. When people drive, car/bicycle/... they want to go to their destination, not stop. And everybody else is just in their way. You see this in every country around the world. In Amsterdam I met crossings where too many waiting cyclists would block those going straight and those turning right. And they had pushed the button to get green. Asphalt is so nice. I hate that place in Lyngby that David linked to http://www.copenhagenize.com/2010/07/lyngby-cycle-track-design.html I think it is a bad example. There's a very simple reason why countries do not choose to copy the Dutch style of bike infrastructure - political opposition by motorists. Building Dutch-style cycle infrastructure would have a serious negative impact on motorists in the short-term, and that's enough to kill it in countries with lower levels of cycling than the Netherlands. How about this one in Rotterdam? Have a pan around the junction. There's those cycle signals half way across but I'm pretty sure they run in sync with the traffic signals for that road. Never been too sure what you are supposed to do here? Even Dutch infrastructure has mistakes and risks. I don´t know any place like that in Copenhagen. David: Thanks for pointing that out, I didn't know. Stefan: There are 5000 km of on road cycle lane and 27000 km of segregated cycle path in the Netherlands. That's about a quarter the length of segregated path as the length of the roads in the country. Not all of it was built yesterday. As a result, it is not really all that difficult to find examples of old provision which do not meet current standards. This is particularly true in Amsterdam and Rotterdam. Amsterdam is not the place to look to see a showcase of best practice for this country. That's a good part of why Amsterdam features so infrequently on my blog and also a good part of why I don't live there. The lack of quality of some of the provision is reflected in the lower rate of cycling in Amsterdam compared with many other Dutch cities. In particular, Amsterdam has the lowest rate for cycling to school for first year secondary school students (only 53%. This age group is important as it's the first time that children are expected to cycle a longer distance to school) anywhere in the country, in part due to the relative lack of subjective and social safety of Amsterdam. There is a key difference between the older and less good infrastructure which you highlight in Amsterdam and the junctions which I highlight in Copenhagen. No Dutch person would show the occasional bad examples of old provision as being good. Everyone knows that the old infrastructure is less good. A lot of it either has already been replaced or is planned to be replaced, and modern standards are much better. On the other hand, examples of bad and mediocre infrastructure from Copenhagen are current designs and being promoted internationally as aspirational. Don't believe the hype. This provides a very dangerous example for the world to copy. Incidentally, that example that you give of somewhere that Amsterdam cyclists have to stop and press a button: Do you know from personal experience that this is the case ? It's very unusual if it does not have a loop which detects bikes. Your blog is interesting. I can't say I'm terribly impressed with either the old or the new in Hamburg. Hopefully at some point the local government will see sense and make conditions tolerable enough that Hamburg's cycling rate grows past 13%. 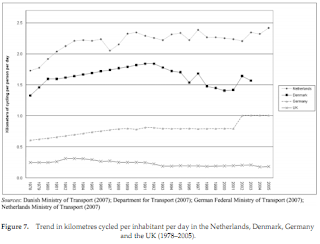 The standard of provision is proportional to cycling rate, and this is one of the major reasons why NL's cycling rate is so far ahead of the rest of the world. There are also places in Copenhagen where you have to press a button to get over, but they are rare. I have found 3, and they are all where a recreational bicycle path crosses a major road. Three years on and apparently Southampton Council are trumpeting one of these junctions as the very latest thing, pioneering, even - and something which will attract cyclists. Andrew: I think the junction you're referring to is one that I wrote a little about this year in a blog post. It's really rather sad that Southampton is claiming so much for something so very poor. In any case, if the city wants to attract cyclists, it needs a lot more than one junction. The most important result from Dutch experiments in the 1970s was finding out how much it took to make people want to cycle. To achieve their state aim, the entire city would have to be covered with high quality cycling infrastructure. You may also be interested in a blog post which points out other examples of "Dutch" infrastructure which should not serve as inspiration. We offer cycling study tours here in the Netherlands on which we show politicians, planners and campaigners both the best practice as well as demonstrating why less good things don't work.